Ceru ran into the Gym immediately after he got Pachirisu healed, his palms sweating and his mouth already turned to a grin. He was so freaking excited for this- His first Gym battle, ever. And he was going to win, he knew this. It was going to take a lot of effort, he was really going to have to put his all into this, but he would win. Pachirisu and Snorunt would assure this. He took a second to observe the mossy area and all the trees- What a spectacular thing to have inside of a building. He breathed in and relished the smell of the area, and then proceeded to walk farther in, automatically taking his place at the arena. I notice the man and let out a deep sigh. "Very well." I say somewhat hushed,still somewhat disappointed about my lose against the previous battiler. "I am Joshua,the pokemon Gym leader of this town. Summon your pokemon and we will get started." Ceru nodded excitedly, grabbing Snorunt's Pokeball. He wasn't going to use Pachirisu unless forced too, or if Snorunt got too weak- He still wasn't completely sure about his ability to fight. Nearly bouncing, Ceru threw the Pokeball at the ground, it hitting it with a loud smack and then bursting out white light. After the Pokeball returned to Ceru's hand, Snorunt could be seen standing there in front of him. "You first, mister Gym Leader." "Go on out,Ledyba." I call out as I toss the pokeball out onto the field. The ledyba appears and flys around in a vertical circle,going up and down. I continue to sit at my throne. "Super sonic." I say as Ledyba then fires off a supersonic wave. "Crap!" Ceru called out, quickly clutching his hands into fist. "Snorunt, hurry! Protect!" With this command, Snorunt bent slightly, curling in on himself and throwing up a protective sphere of green energy around him. This would surely protect him from the dangerous effects of Supersonic. Ceru didn't want Snorunt disoriented and confused, at least not his early in the fight. It was key that he was in top condition. I notice the protect and wait for it to end. "Use supersonic again Ledyba." I say and Ledyba uses super sonic once the protect ends. Ceru grimaced as he hadn't realized that fact- Supersonic was a non-physical move that could be used over and over again, all it needed was to wait until Protect ended. It wasn't smart to use a defensive move such as protect against moves that couldn't backlash or stall an opponent. Snorunt was hit by the sound this time, disorienting his vision and hearing and causing him to waver slightly in step. Ceru wasn't going to have this ruin the fight with him, however. "Snorunt, jump and fire Icy Wind!" Snorunt understood this much, despite the confusion, and blindingly jumped and fired a wide blast of Icy Wind in Ledyba's general direction. "dodge it Ledyba and use silver wind." I command and Ledyba quickly dodges before firing off a powerful silver wind attack back at Snorunt,seeing the disorientation it should make it's landing hard even if the attack misses because of the wind power itself. Ceru sighed as the Ledyba dodged- What a fast little Pokemon. Silver Wind was a strong move, but not stronger than Icy Wind, hopefully. As Snorunt fell back to the ground, he almost tripped over his feet, falling back slightly but not completely thanks to Supersonic slowly wearing off. "Snorunt, fire Icy Wind to counter the Silver Wind!" Snorunt shot this attack off, tilted back enough to perfectly meet the attack with his own. It was quite cool looking, in all honestly. Two gusts of different winds, Icy Wind mixed with small ice-like particles and Silver Wind having elegant crescent shapes imbued into it. "Ledyba move to the side and use silver wind again." I said as the snorunt was firing the icey wind. Ledyba quickly moved about 10 feet to the right of Snorunt and used another silver wind while the icey wind is being fired,hoping that Ceru will be unable to see LEdyba from moving from the spot since two attacks blocked the way. The attacks clashed, and tied, both dissipating after they hit. Snorunt closed his mouth when Ledyba had gotten to the side, the Icy Wind ending. "Snorunt, quickly! Jump and use Icy Wind!" Snorunt would jump higher into the air than before, the supersonic's effects nearly completely gone now and Snorunt twisting in mid-air to face Ledyba. The Silver Wind would continue forward and hit under Snorunt, while Snorunt fired another Icy Wind at Ledyba. "Dodge and use supersonic." I say calmly,sitting in my throne lazily,my voice barely speaking. Most people by now would assume I just whisper. Ledyba uses super sonic again after dodging the icey wind,going more to the right,ending up behind Snorunt by 15 feet. I grin this time, not put off. The little bugger couldn't get away from this next attack. There was no way in hell Snorunt was going to get hit by another Supersonic, despite it being sound, it could be countered. With other sound. Twirling his finger lightly and nearly skipping in place, Ceru brought about his plan. "Snorunt, spin and use Icy Wind!" Snorunt did as such, spinning quickly and blasting out Icy Wind in all directions, lashing out at Ledyba. Not only this, but the key part of this strategy was revealed. The cold wind and the air's force against it while it was blasted generated a loud roar that blocked out the sound of Supersonic, making this an offensive AS WELL as a defensive move in one. "Silver Wind." I say and Ledyba flaps her wings hard,generating wnid underneath her. As the attack is fires Ledyba goes up from the force of her Silver wind.Ledyba begins to circle the arena,not letting up to not show the snorunt a moment of weakness. Ceru sighs- This thing just wouldn't give up. He had hoped he would have hit her by now.. But it can't do this forever. The cold generated by all the Icy Winds so far should start to affect her about now, and then Snorunt will have this fight in the bag. "Snorunt, give chase!" Ceru called out, throwing his arms into the air. Snorunt did as so, not affected by the colder enviroment, and chased after Ledyba, homing in. When he got within six feet of Ledyba, he stopped. Grinning, Ceru gave his next order. "Snorunt, Icy Wind! It can't dodge at this range!" Snorunt grinned as well, opening his mouth wide and blasting off an Icy Wind attack. I noticed the speed of Ledyba decreasing because of the cold air around the gym. However Ledyba stayed up high in the air,spinning circles around the arena,watching Snorunt chase her. Snorunt tried to approach Ledyba I called out an attack. "Silver Wind" I call out before the Icey wind is called. "Now move away." I say and Ledyba uses what wind it can to begin to move away before the icey wind prevails. Ceru grimaced- None of his plans or attacks were working. Hell, he hadn't even been able to hit the dang thing. As expected, the Icy Wind won over Silver Wind, though it was more along the lines of both attacks clashing and dissipating equally. ".. Tch.. Snorunt! Jump as high as you can, propel yourself at the Ledyba, I don't care! Use Bite!" Snorunt let out a low pitched, angry sound, and then obeyed, jumping as high as it could off the ground and trying to get a shot at Ledyba with Bite. I escaped the icey wind,just barely though,the cold wind slowing me down more and more. "Ledyba use mach punch." I called out. Ledyba,stopped flying right above Snorunt and let gravity bring her down,letting her wings our the last second Ledyba uses the move mach punch at Snorunt's head. Ceru nearly cried out- This was not going well! If that mach punch.. If it hit, that would be horrible for Snorunt! Freaking type matchups... "C-crap! Snorunt!! Nevermind Bite- Icy Wind! Icy Wind right now!!!" Snorunt looked visibly shocked by Ceru's ferocity, and with his mouth already opened, fired a direct blast of Icy Wind instead of biting down. He hoped this would not only keep Ledyba's mach punch from hitting him, but also damage her, finally. As Ledyba opened her wings to steady herself for her Mach Punch, she was hit by a huge blast of cold wind. That was probably Snorunt's Icy Wind. The wind caught on Ledyba's wings, causing her to rapidly deccelerate right before the Mach Punch landed. Joshua could see at once that the power of the Mach Punch had been greatly reduced by the Mach Punch. Ledyba was also weakened by the full onslaught of the Icy Wind. As the exchange of blows ended, Ledyba flew slowly into the sky. It was obvious that Ledyba was straining herself very hard to keep herself in the air. "Impressive attack...", Joshua said, impressed by this challenger's quick and reflexive use of his Pokemon's moves to reduce the impact of Joshua's attack. Snorunt let out a pained noise as the Mach Punch connected- Even weakened, the type disadvantage was hard to ignore. Snorunt fell to the ground, landing on his feet but also crouching down slightly. He was tired from this lasting battle, Ceru could see that. But at least they had finally hit Ledyba, right? "C'mon, Snorunt. I know you can last longer than this. Take Ledyba out!" Ceru reached his arm out and made a gun with his fingers and hand, pointing directly at Ledyba. "C'mon, ICY WIND" Snorunt opened his mouth wide and blasted the attack out towards Ledyba, putting a good amount of power into the attack but saving some for if he needed it later. Ledyba, weakened from the earlier Icy Wind and having its mobility reduced, was hit square in the face by the Icy Wind attack that Snorunt was now firing. There was no way that Ledyba could dodge that attack. Joshua's mood fell when he saw the attack hit. "Not bad... But is your Snorunt able to face my ace..? Scyther, go! ", said Joshua, as he recalled his Ledyba and sent out his Scyther. Ceru grimaced at this. Snorunt wasn't beaten yet, and still had some energy left in him, but he was still tired, nonetheless. Ceru was just hoping Snorunt could last.. "Dangit, dangit, dangit!" Ceru called out, his urgency getting Snorunt on his guard. 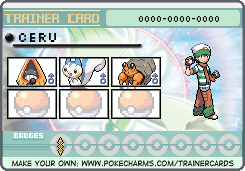 Scyther was a strong pokemon, Ceru had heard of him. Scyther looked extremely dangerous, and Ceru was worrying. Snorunt wasn't finished yet, but he was close- That last battle took too long, took too much energy. "Sn-snorunt! Bite!" Snorunt nodded and jumped at Scyther, lunging more like, opening his mouth wide in an attempt to bite down on the large bug pokemon. Joshua's Scyther easily dodged the attack from the Snorunt. The Snorunt was already weakened from that battle with Ledyba. It was in no shape to battle Scyther. Not while it was extremely exhausted. "I would suggest switching Pokemons right now. No trainer would let their Pokemon battle while in this condition...", Joshua said. Joshua was a Gym Leader who was passionate about Pokemon as well and he could not bare to see the Snorunt battling his Scyther in such a weak condition. Ceru grimaced. He knew this, he knew this. He needed to withdraw Snorunt. He shouldn't allow him to keep fighting. But... But Pachirisu. Pachi wasn't yet ready to take on a Pokemon of Scyther's caliber. That's what Ceru thought, at least. He sighed, letting it out for a second, and then raised his head high. He had to do this, for Snorunt's sake, and the sake of this gym battle. Bringing out Snorunt's Pokeball, the snow hat Pokemon let out a quiet cry as it was transferred in a flash of red light, weakened but not wanting to stop fighting yet. Ceru brought out his other Pokeball and tossed it into the air, the object bursting open and Pachirisu appearing center-stage in a stream of white light. Ceru fixed his gaze on the gym leader, glaring. "You want a fight? I'll give you a fight. Pachi! Spark!!!" Pachirisu looked confused by this situation but nodded, designating Scyther as his target. Dashing at the Pokemon, Pachirisu got covered in a burst of blue electricity, moving quite fast.